Vancouver - Evening Skyline - 24P - ProRes 4:2:2 10 Bit - UHD 4K Skyline of downtown Vancouver after dark. Also seen is the Cambie street bridge as well as BC Place stadium. 4k00:16Vancouver - Evening Skyline - 30P - ProRes 4:2:2 10 Bit - UHD 4K Skyline of downtown Vancouver after dark. Also seen is the Cambie street bridge as well as BC Place stadium. 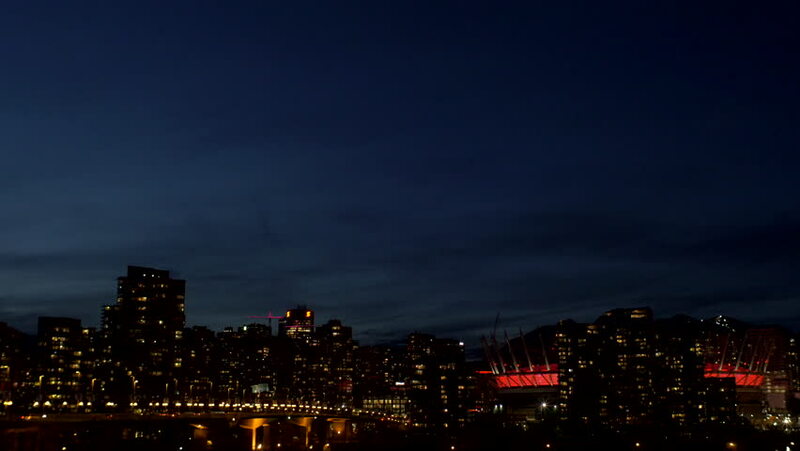 4k00:15Vancouver - Evening Skyline - 30P - ProRes 4:2:2 10 Bit - UHD 4K Skyline of downtown Vancouver after dark. Also seen is the Cambie street bridge as well as BC Place stadium. 4k00:10Aerial view of fireworks and cityscape. Timelapse. 4k00:06A rare natural phenomenon is the light pillars in the city. Cold winter morning, city landscape, time-lapse 4K. 4k00:08Time Lapse: Full moon in the night sky against the backdrop of the city, sleeping area.